No added sugar. 4 Cals per cup. 100% Arabica coffee gently infused with the nutty taste of lightly roasted hazelnuts. 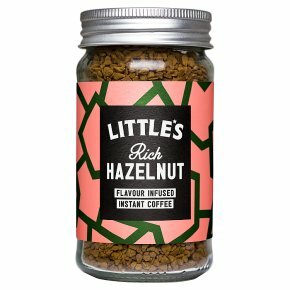 To make the perfect coffee, grab your favourite mug and add a heaped teaspoon of Little's coffee. Boil the kettle and let the water stand for a minute before pouring over the coffee. Never use boiling water. You're aiming for 94 degrees Celsius, to be geeky. Our coffees taste great black, but if you're feeling naughty, a touch of demerara sugar and a dash of whole milk will really jazz things up. If cow's milk isn't your thing, feel free to use milk alternatives. Oat m*lk works especially well. If you want to really push the boat out, ditch the water altogether and make the coffee like a hot chocolate; with just hot milk. For added enjoyment, grab a friend and have a good old catch up.